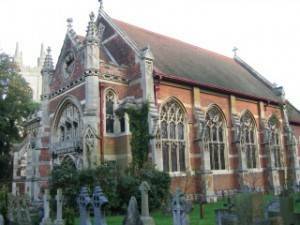 The outside of the church is finished in red brick and roofed with Broseley tiles, but variety is achieved by the use of banding and ornaments in Bath stone. The west front is unusual in that it has no window. Instead there is an ambitious scheme of statuary, providing a strong assertion of the Benedictine role in the development of English Christianity, as well as introducing the patronal saint, Edmund, martyr-king of East Anglia (841-69). 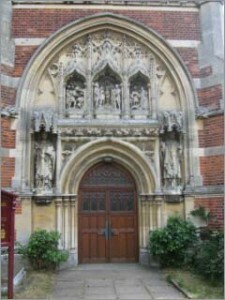 In keeping with this scheme the arch of the doorway is flanked by two key figures in the evangelisation of England, on the left the Benedictine Pope Gregory the Great (c540-604), the patron saint of Downside Abbey (founder and trustee of the parish) and on the right the monk he sent to convert the Angles, St Augustine, first Archbishop of Canterbury (d 604). Above the doorway, and linking the two saints, runs a course decorated with vine leaves and grapes in which there are three crowns, the circlets ornamented with alternate leaves and arrow flights. This combination of a crown with arrows as an emblem of St Edmund recurs persistently throughout the building. Looking further upwards, in the tympanum of the large arch which dominates the porch there are three canopied reliefs illustrating episodes from the legend of St Edmund. The left hand niche shows Edmund as he kneels before his captors, the Danish princes Hyngwar and Ubba, but refuses to deny Christ; the central relief depicts his martyrdom, the saint bound and pierced with arrows prior to beheading; the right hand scene then shows the discovery of his missing head, which according to legend was guarded by a wolf. Finally, in the gable above the archway, there is a circular six-foiled recess in which St Edmund sits enthroned. The porch is framed by two handsome diagonal buttresses which display decorated panels on the front and rise to crocketed pinnacles at the top. These set the pattern for the sequence of six buttresses that give added depth to the south side of the church, dividing the nave into four bays and framing the chancel. Set within the bays on the south side of the nave are four large windows, each of three lights culminating in some delicate tracery and divided horizontally by cusped transoms. The smaller chancel windows, which are designed with a rather different function in mind, have only two lights and these are undivided, but the overall effect consciously evokes the perpendicular style characteristic of East Anglian church architecture at its 15th century heyday. The viewing of the exterior is completed by a look at the Baptistry which occupies the accessible area on the north side. This, the last section of the building to be completed, is something of a luxury in a church of this size. It is a measure of Frederic Smith’s generosity that he was prepared to add what is by any standards a lavish finishing touch to his parish church, and it confirms the sense that his governing intention was to provide a building that, in spite of restricted space and a small congregation, could provide an impressive setting for the full realisation of Catholic worship. For his part, the architect clearly planned to give weight and dignity to what might have ended as a modest chapel by his use of buttresses and ornate stonework, and this is especially clear in his design for the Baptistry. Here the use of flying buttresses on the outward corners of the octagonal building give it a note of drama, and this is taken up by the gargoyles which jut out above them, just under the castellated parapet. While the windows are necessarily narrow single lights they draw the eye upward, as do the empty niches on the face of the buttresses, and this thrust is completed by the conical shape of the bronze roof. It is a satisfying conclusion to Frederic Smith’s generous benefaction. The porch is lit by two small windows, one of St Paul on the north and one of St Peter on the south, though the latter is normally obscured by the door leading to the organ loft: further evidence of the cramped arrangements imposed by the presence of old graves, some stones of which can be noticed in the back wall. Two doors lead into the nave, the two holy water stoups being situated between them, and a brief account of the Benedictine mission is displayed above. On entering the church, the logic of its conception can best be appreciated by following the successive stages in its construction, beginning with the chancel, which is separated from the nave by an impressive arch with elaborately moulded jambs, carved capitals and arch mouldings. Originally there was also a distinctive brass altar rail running across the archway, but this was removed in 1992. The wooden chancel roof is one of the most striking features in the church: it is carried on two braced arches which rest on wall posts supported by four flying angels, another echo of earlier East Anglian models. These angels carry shields displaying alternately the St Edmund crown-and-arrows motif and a crown of thorns encircling the word Pax (peace), often taken as a Benedictine emblem. The side-walls are covered to window height by oak wainscoting, with an elaborate top-cresting in which the crown and arrows are again evident, and there is more intricate wood carving along the parapet at the base of the roof. However, the main feature in the chancel has to be the altar, tabernacle, and reredos which dominate its space and, indeed, that of the church as a whole. These were constructed, we are told, ‘from the designs and details of the architect’ using Caen stone, with Devonshire marble for the shafts of the reredos. But one odd thing is the striking resemblance between this reredos and the lavish one constructed in 1883 for the Benedictine parish church at Abergavenny, designed by Edmund Kirby of Liverpool, ‘a maestro of the reredos’. There is no evidence that Kirby had anything to do with Bungay, but both works were carved by A.B. Wall of Cheltenham, whose interest in angels is also evident from the transept altar at Downside Abbey (1882), and the priest at Abergavenny at the time was none other than Dom Ephrem Guy, who moved to Bungay in 1885. With the collaboration of the architect, it seems, he and Wall contrived to recreate a version of the Abergavenny experience for Suffolk. 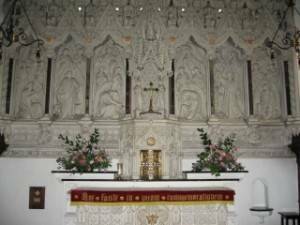 Reredos – A decorative screen or facing on the wall at the back of an altar. The governing idea behind the whole can best be understood in terms of the adoration of the Blessed Sacrament, especially in such practices as the Forty Hours’ devotion, then highly popular. Above the tabernacle, where the crucifix stands, is an exposition throne, and here the monstrance would be placed for adoration, thus providing a focal point for the adoring angels on either side. At the base of the reredos six angels are shown in three-quarter length, each holding a scroll inscribed ‘sanctus’, evoking the words sung ceaselessly by the heavenly choirs and which preface the canon of the Mass. Above them, in the six bays that flank the exposition throne, more angels are engaged in adoring, in censing, and in playing music. Higher still, seated on thrones set between the gabled canopies are six more angels playing on instruments: from the left, the tambourine, the triangle, trumpets, the harp, the organ, and cymbals. 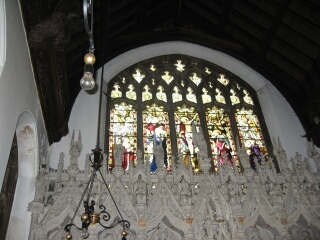 Finally, at the very top – and difficult to make out against the east window – stand the seven archangels. It is most unusual to find all seven portrayed together in this way, so it makes the parallel with Abergavenny all the more intriguing. At the far left, displaying white roses in the fold of his mantle, is Barachiel, the benediction of God. Next to him stands Raphael, carrying the staff and fish which link him to the story of Tobias, and he is followed by Gabriel who bears in his left hand the lily of the Annunciation. At the centre is the easily recognized figure of St Michael, trampling on the satanic dragon, his sword raised in his right arm while the left supports his shield and holds up a pair of scales, the sign of his role as weigher of souls in the Last Judgement. Further to the right is the figure of an angel holding a knife and a chalice who can only be Sealtiel, the intercessor. Usually he is shown with hands joined in prayer, but in this case the knife may be that taken up by Abraham to sacrifice Isaac before ‘the angel of Yahweh’ prevents him (Genesis 22:11-15), while the cup may be that which symbolizes Christ’s sacrifice in Luke’s account of Gethsemane (Luke 22:42-43) when ‘an angel from heaven’ comes to give him strength. Sealtiel is followed by Uriel, guardian of the gate of Paradise (whose flaming sword shows the difficulty of trying to carve fire in Caen stone), and the sequence is complete by Jehudiel, the remunerator or rewarder, who holds out the stark alternatives of a crown or a whip. Angels do seem to have had an important role in the Victorian religious imagination, and the design of the reredos gives them full play. Standing out prominently against the white stone, too, are a number of painted and gilded motifs – on the altar front, on the tabernacle, and above the marble shafts on the reredos – which turn out to be the crown and arrows of St. Edmund and the crown of thorns encircling Pax, and these help to bind the whole decorative scheme into a unity. In the chancel, as in the nave, the use of stained glass in the windows has been carefully programmed, but the aims in the two sections of the church are quite distinct. The whole theme of the chancel can be found clearly stated in the east window above the altar – it is planned as a memorial to Frederic Smith’s parents Samuel and Isabel who appear in the outer lights, kneeling in the time-honoured pose of donors. It was, ultimately, Samuel’s estate that made the building possible, and in his hand is what must be intended as a model of the new church. The east window offers a further instance of cross-fertilization: it was made by the distinguished Birmingham firm of Hardman and Co. which provided glass not only for Pugin’s Houses of Parliament but also for some of the finest Catholic buildings of the period, including Downside, St John’s at Norwich, and Our Lady and the English Martyrs at Cambridge. The company had also, as it happens, furnished the east window over the reredos at Abergavenny. One of the firm’s major projects was the provision of a great west window for the restoration of Tewkesbury Abbey in 1886; the programme designed for it included a scene of the crucifixion, and this was adopted as the model for the Bungay window two years later. The Bungay crucifixion occupies five lights, as opposed to just three in the Tewkesbury window, so that the two angels are moved out to hover over the donors, and the two thieves are introduced into the space above Mary and St John. Another new feature is the unusual red and blue mandorla used to surround the figure of Christ. Below the figures is a scroll with the inscription “Pie Jesu Domine, dona eis requiem sempiternam” – a plea for mercy on behalf of the older generations of Smiths. In the tracery lights immediately above the main section are displayed the instruments of the Passion: 30 pieces of silver, the swords and clubs of those sent to arrest Jesus, Veronica’s veil, the whipping pillar and scourge, the nails and crown of thorns, the tools of the executioners, the chalice (representing the blood and water from Christ’s side), the cross itself, the sponge and vinegar, and Christ’s seamless garment. In the four spade-shaped lights above are the emblems of the four Evangelists: a man for Matthew, a lion for Mark, an ox for Luke, and an eagle for John. At the very top, between two smaller lights giving the Greek monograms for “Christ” and “Jesus”, is the image of the pelican ‘in her piety’, piercing her breast to feed her young with her blood, an ancient symbol of Christ’s sacrifice. One other window at Bungay can be attributed to Hardman: that in the centre of the south chancel wall depicting Saints John Fisher and Thomas More. It is arguably the best window in the church, chiefly because of its uncluttered presentation of these two proto-martyrs of the English Reformation. The decoration of the window is based on martyrs’ crowns and palms, and the initials ‘f’ and ‘m’, but there is none of the architectural framing found in the other windows. Fisher and More were at this time only beati, having been beatified together in 1886 (which may explain the rather subdued haloes), and this window must be one of the earliest, if not the earliest, representation of them in a church. The likenesses can clearly be traced back to Holbein’s portrait drawings of the two saints. Fisher is shown in episcopal vestments as bishop of Rochester, carrying in his right hand a martyr’s palm and a book – probably an allusion to his writings in defence of orthodoxy against Martin Luther. At his feet are his coat of arms and the cardinal’s hat, awarded him by Paul III in a vain effort to save his life. Thomas More, more austerely, stands by the executioner’s axe – he, too, carries a martyr’s palm as well as a book to commemorate his polemical writings in defence of the Church – and in his right hand he holds the pouch inscribed with the royal monogram ‘HR’ and containing the Great Seal, the sign of his office as Lord Chancellor. Both saints had refused to acknowledge the Royal Supremacy over the English Church and Fisher was beheaded on 22 June 1535, More following him to the scaffold on 6 July. They were eventually canonized in 1935, and more recently John Paul II nominated Thomas More as the patron of those active in political life. The other two windows on the south side were made by Swaine Bourne, another Birmingham firm, but in a sharply contrasted style of Victorian glass-making. They are more consciously archaic in their use of architectural canopies and pedestals and in their intricate detail, as with the branches behind the figures which hint at a landscape background. The first window, that at the east end, shows on the left St. Ephrem of Syria (c 306-73), a monk and voluminous author whose place in the scheme of the windows is due to his role as patron saint to Dom Ephrem Guy, and he is followed by St Anne, mother of the Virgin Mary, teaching her daughter to read, a popular theme in late medieval art. In the third window the left-hand figure, his hand raised in blessing, is St Richard of Chichester (1197-1253), an exemplary diocesan bishop whose burial place had been an important site of pilgrimage in medieval England. Beside him stands St Elizabeth of Hungary (1207-31) whose brief life compassed marriage to the Landgrave of Thuringia, early widowhood, and a final phase as a Franciscan Tertiary in circumstances of severe austerity. Finally, the upper lights in both of the Swaine Bourne windows are filled with musical angels, while the two small lights at the very top show a flaming heart and Christ on the cross – all available space is used. The north side of the chancel has only two windows, in this case made by a London firm, W.B. Simpson and Sons. Simpson had a reputation for tile decoration and something of this may be reflected in the strong colour contrasts and the use of tile-like patterns in the marginal ornaments. The first window, at the east end, has an immediate relevance to the story of the church as it depicts Saints Catherine of Alexandria and Frederic of Utrecht, the patrons of Frederic Smith and his wife Catherine. St Catherine (early fourth century?) is shown here with her usual attributes, a crown to indicate her elevated birth, the wheel on which she was to have been executed until heavenly intervention broke it (she was eventually beheaded), and a book to indicate the great learning with which she defended Christianity against pagan philosophers. St Frederic, in the second light, son of the king of Friesland, was also a martyr, engaged in the evangelisation of the Netherlands. Created bishop of Utrecht, he was assassinated by a resentful pagan in 838 while celebrating Mass, hence the sword held in his left hand. The final window in the chancel also has a family resonance: the right hand light shows St Isabel of France, patron of Isabel Smith, Samuel’s wife and co-donor with him in the window behind the high altar. Beside her, in order to complete the chancel programme, is the patronal saint of the church, St Edmund – shown here bearing a crown and an arrow. It is not clear why Bernard Smith, the architect, chose to divide the chancel windows among three makers. It does provide an interesting range, but speed of delivery may have been a factor, as may cost. The Hardman windows were charged at £250, which, given their quality and the prestige of the company, is not surprising. Those in the north chancel by Simpson cost £85, and those in the south chancel by Swaine Bourne were just £80. In the case of Hardman, of course, actual portraits – the older Smiths, John Fisher and Thomas More – had to be prepared, rather than imaginary likenesses. 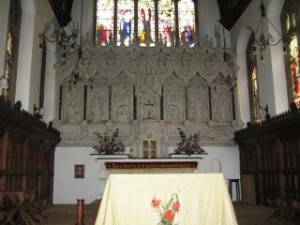 But it is clear that the building of the chancel was seen as an act of family piety in which the commemoration of family saints had a central role. What is interesting is the appearance of the newly beatified martyrs, More and Fisher; it suggests the sense of a ‘second spring’, in Newman’s phrase – that revival of Catholic confidence which the new building exemplified. And Frederic Smith must have derived some satisfaction from seeing a fellow lawyer in stained glass. Inevitably, changes in the liturgy since the 1960s have necessitated some modification of the sanctuary area. A marble altar was introduced in the 1970s to allow for Mass to be celebrated facing the congregation, but in the course of a major reordering of the space in 1998 this was replaced by the present wooden altar and the sanctuary was raised by a step to improve sighting. At this time, too, a new lighting system was installed. 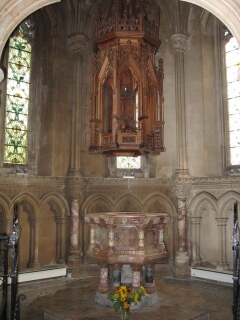 The old pulpit, which had stood to the south of the chancel arch, was dismantled and elements of it used to construct the ambo now used for the readings at Mass. As already noted, the altar rails had been taken out in 1992, though it is still possible to see the brass plates where they were attached to the pillars of the chancel arch. The most distinctive feature of the nave has to be the carefully-planned programme of stained glass which runs in two separate series along the whole of the south and part of the north walls, all supplied by the firm of Lavers and Westlake. Here the scope provided by the larger windows, each with three lights and divided horizontally on the south by cusped transoms, allows for the elaboration of two distinct themes: episodes from the lives of saints associated with major religious orders in the upper lights, and the fifteen mysteries of the Rosary in the lower ones. Apposite scriptural texts appear at the bottom on scrolls held by angels. The themes can best be ‘read’ by following a clockwise course, beginning with the easterly window on the south, above the door into the cemetery. (a) St Bede (673-735), the ‘Venerable’, a monk of Jarrow and Doctor of the Church. He is shown on his deathbed, dictating his translation of St John’s Gospel into Anglo-Saxon to a boy scribe. (b) St Benedict (c480-c.547), founder of Western monasticism and Patron of Europe. In this, one of the conventional episodes of his life, the dying saint – who looks remarkably youthful – receives the viaticum. (c) St Scholastica (c480-c.543), Benedict’s sister and founder of the first Benedictine community for women. On his last visit to her, sensing her own impending death, Scholastica prayed, successfully, for a storm to delay his departure. Hence the lightning in the background. (a) The first Joyful mystery of the Rosary, the Annunciation: Gabriel greets Mary, while the power of the Holy Spirit is shown descending on her in a beam of light. (b) The Visitation: Elizabeth kneels to Mary, while Joseph stands in the background. (a) St Bruno (c1031-1101), founder of the Carthusians, shown in prayer before a crucifix. The background suggests the mountainous setting of the first community at the Grande Chartreuse, above Grenoble. (b) St Gertrude (1256-c1302), known as ‘the Great’. She was a Benedictine nun at the convent of Helfta in Thuringia, noted for her mystical experiences and the writings which grew out of them and in particular for her pioneering advocacy of devotion to the Sacred Heart. In the window she appears to address a gathering of bishops, but this must symbolize her importance as a spiritual teacher rather than any actual historical episode. (c) St Bernard, abbot of Clairvaux (c1090-1153), sometimes known as ‘the mellifluous Doctor’ because of his eloquent writings. He was largely responsible for the extraordinary spread of the Cistercian Order across Europe in the course of the 12th century, and his devotion to the humanity of Christ had a deep influence on Catholic spirituality. Seated before a reading stand, the saint here sees a vision of Mary and her son, accompanied by an angel. (a) The Presentation of the infant Jesus in the temple, the child in the arms of Simeon and St. Joseph carrying the traditional offering of a dove. (b) The finding of the child Jesus in the Temple; while he is talking with the doctors of the Law his distraught parents peer through the screen at the back. (c) The five Sorrowful mysteries now follow, beginning with Christ’s agony in the Garden of Gethsemane. Upper lights: This window commemorates saints of the Franciscan Order. (a) St Antony of Padua (c1193-1231), a Portugese associate of St Francis noted for his biblical learning and his powerful preaching. Here he is preaching to an audience of fishes, a legend inspired by St Francis’ sermon to the birds. (b) St Francis of Assisi (1181-1226), the poor man of God, who urged on his followers a life of apostolic simplicity, free from the distractions of property. In 1224, while on retreat on Mt Alverna, he had a vision of a seraph in the form of a cross and received the marks of Christ’s wounds. This is the scene depicted here. (c) St Clare (1194-1253), founder of the Poor Clares under the direct inspiration of St Francis. The window illustrates the occasion when a hostile army – which included Saracens – threatened Assisi and Clare, though sick, confronted it with the Blessed Sacrament and drove the enemy to flight. (a) Christ is scourged at the pillar. (b) The crowning with thorns. (c) The carrying of the Cross. Upper lights. This window commemorates saints of the Dominican Order. (a) St Thomas Aquinas (c1225-74), one of the greatest theologians of the Latin Church, he was also gifted with spiritual revelations which led him at the end of his life to describe his writings as so much straw. It is this side of him that is shown as he kneels before the crucified Christ. (b) St Dominic (c1170-1221), founder of the Order of Preachers. From his left hand hangs a rosary, a devotion much promoted by the Dominicans. (c) St Catherine of Siena (1347[1333? ]-1380), one of the most remarkable women of the Middle Ages, who became a member of the Dominican Third Order. In the window she kneels in a pose very like that of St. Francis, so the scene may record her reception of the stigmata at Pisa in 1375. (a) The last of the Sorrowful mysteries, the Crucifixion. (b) This leads on to the first of the Glorious mysteries, the Resurrection, where the triumphant figure of Christ rises from the tomb, carrying the banner symbolic of victory. (c) The sequence on the south side concludes with the Ascension: Christ, surrounded by an almond-shaped mandorla of light, rises out of the view of the Apostles. Before leaving the south side it is worth noticing the portrait of St Edmund hung between the second and third windows; this was presented to the church in memory of Hugh de Poix of Broome; the frame is reputed to be made of the Hoxne oak against which the saint was executed. Turning now to the north wall, the section at the west end – that nearest to the entrance – is without a window but instead has a stone memorial to Frederic Smith and his wife Catherine. Then, in the centre, two large arches open out into the Lady Chapel. Beyond these, however, at the east end of the nave and above the door of the sacristy, is the concluding window of the Rosary series, that which represents the three remaining Glorious mysteries. On the left the descent of the Holy Spirit on the Apostles at Pentecost, in the centre light the Assumption of Mary, and to the right her coronation at the hands of her son, the triumphal conclusion of the redemptive process initiated at the Annunciation. This window completes the decorative scheme of the nave. From this vantage point, too, it is worth having a look back at the organ, situated over the porch in the west gallery. This was built by Norman and Beard of Norwich and is equipped with two manuals and a pedal board. The attractive gothic style housing is made of oak, the case surmounted by angels with trumpets. The Lady altar is dominated by a richly-carved gabled altarpiece in stone, showing the Assumption of Mary; set within a cusped cinquefoil arch, she is borne upwards in a state of ecstasy while two angels above hold her crown. Further angels fly beside her, carrying scrolls that, surprisingly, are blank. The chapel has two windows, both of them having three lights but without the dividing transoms, which allows here for a more pictorial effect. It is clearly no accident that the window on the left is situated close to the Baptistry: the first light shows Christ’s circumcision, while the right hand one depicts his baptism in the Jordan by John the Baptist at the very beginning of his public ministry. But then the centre light, showing the administering of baptism in a church, brings together the Old Testament sign and the New Testament reality in the actual sacrament. In the other window all three lights are used to present the wedding feast at Cana, Mary’s one recorded intervention in her son’s ministry. As a servant pours water into the jars, Christ blesses them. An odd feature of these two windows is the mixture of costumes: the scriptural characters wear traditional ‘biblical’ dress, but those around them, most obviously those at the feast, are in medieval garments – maybe this is a way of suggesting the continuation of Christ’s presence on earth in the later life of the Church, a theme relevant to both windows. Above the wedding scene stand St Joseph, Mary, and St John, the latter the saint who was adopted as her son at the foot of the cross. Also in the Lady Chapel, hung between the widows, can be found a copy of a painting by Raphael, showing Mary and the child Jesus with the young John the Baptist, presented in memory of Tyrel de Poix. Close to the door of the Baptistry there is a list of monks who have served on the Flixton-Bungay mission. The last phase of Frederic Smith’s benefaction, completed shortly before his death, was the octagonal Baptistry, tucked away at the north-west corner on the site that had been occupied by the priest’s house. As a result it can easily be overlooked, but this would be a serious mistake: many see it as the architectural jewel of the church and it is believed to be one of the largest in England. Entered at the back of the Lady Chapel through a trefoil arch with iron gates, it conveys a sense of light and space. At the same time it is almost devoid of representational elements: all focuses on the marble font. After the solidity of the lower wall, which is lightened by inset blind arches, the stone columns and shafts act as bones to support the tall windows, glazed with attractively restrained ornamental glass. At the very top, the thrust from the shafts opens out into an elegantly vaulted roof. The octagonal structure is mirrored again in the base and construction of the font itself: at the base it is supported by eight marble columns in alternating colours, and further shafts in white decorate the side panels of the bowl. The use of these coloured marbles gives a certain richness, but again the effect is restrained. The font cover is a perfect conclusion for the work, drawing on an East Anglian tradition of exotically carved work of this kind. The form is basically that of a lantern, opening with gabled trefoil arches (octagonal again) to display the one image important for the context, John the Baptist baptizing Christ. The lantern culminates in an elaborate top-crest, above which a crocketed finial rises to the only symbol used in the Baptistery, that of the pelican – the symbol of Christ’s sacrifice. 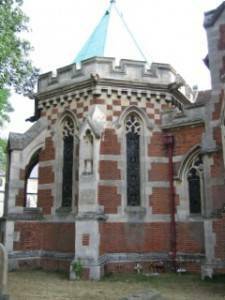 Frederic Smith died on the 18 September 1903, two years after the Baptistry was finished. It is good to know that he lived to see the completion of his brave scheme for a worthy church; it was an act of generosity which leaves the parish of St Edmund’s lastingly in his debt.